The experienced photographer or artist who finds an “S curve” embodied in his subject knows that he has struck compositional gold, and on southwestern New Mexico’s State Highway 152, he will discover a treasure trove of S curves. Relatively little known, Highway 152 begins at Interstate Highway 25 some 51 miles north of Las Cruces, immediately west of the desert lake called Caballo Reservoir. Paved for its entire route, it winds westward for some 75 miles, across the northern Chihuahuan Desert, the Mimbres Mountains, the Mimbres River Valley and the Piños Altos Mountains southern foothills. It ends at Santa Clara, at the eastern edge of the historic area surrounding the quaint and charming community of Silver City. Except for times of winter snowfalls in the higher elevations, the road is safe for all types of vehicles, including large motor homes. Almost immediately after turning west off of Interstate 25, at an elevation of about 4500 feet above sea level, you begin to see signs such as BUREAU OF RECLAMATION BACK COUNTRY BYWAY and NEW MEXICO GERONIMO TRAIL. Then you see another sign: 12’6” BRIDGE CLEARANCE 22 MILES WEST, it warns. Traveling west on the road, I keep that sign in mind. The drive begins innocuously enough, with a straight segment passing occasional small homes, ranches and a sagebrush prairie. 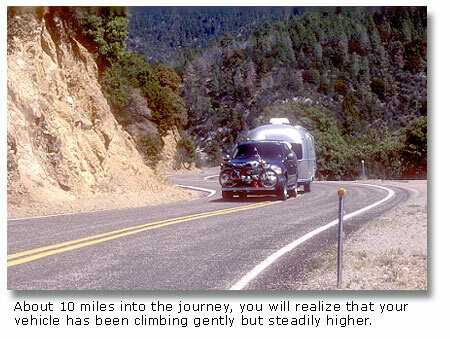 About 10 miles into the journey, you will realize that your vehicle has been climbing gently but steadily higher. At an elevation of some 5,000 feet, you come to the first of Highway 152’s S curves. Five miles farther, at 5,180 feet, you arrive at the town of Hillsboro. This community was founded in 1877, when gold was discovered in the Mimbres Mountains, at the southern end of the Black Range. Hillsboro reached its heyday in 1907, when 1,200 people lived there. Area mines produced $6 million worth of gold ore. Hillsboro claims to have been the last town in America to see an operating stage line. Today, Hillsboro is a quiet community with a population of about 120. It has some well-preserved mercantile establishments, including an ice cream shop furnished with decorative chairs that invite you to sit for a spell. On Sunday mornings, the bells of the Union Church break the stillness by calling the faithful to worship. The church is located on a hill, nestled next to the Hillsboro school and not far from a modest frame house that was built in 1894. Ernest Springer, the current and third owner of the house, will show you a life-size painting of the home’s first occupant, Nanette Miller. It is well preserved, considering that it’s on an outside wall, protected only by a porch. 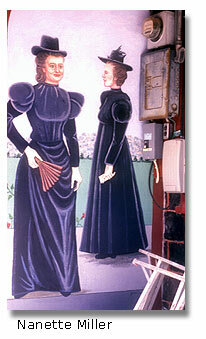 Nanette is the figure on the left in the painting. Her sister is on the right. As you head west out of Hillsboro, you cross Percha Creek, which flows between rugged rock walls. You will encounter a sign that states that this segment of Highway 152 is maintained by the Kingston Spit and Whittle Club. You’ll know you’re about to arrive in the town of Kingston when you approach the bridge with the low clearance. At the bridge, 19 feet in width, the sign says the clearance is 12’ 8,” two inches higher than indicated by the warning sign back near Interstate 25. Two inches difference? I guess the state wanted to avoid vehicles getting stuck under the bridge. Kingston was founded in 1882 when silver was discovered in the nearby mountains. At one time, it had 22 saloons and one church. It had a brothel located on Virtue Street. Its population peaked at 7,000. Now, it has only 32 permanent residents. Immediately west of Kingston, you will begin your passage through the Mimbres Mountains, which are part of the 3.3 million-acre Gila National Forest. 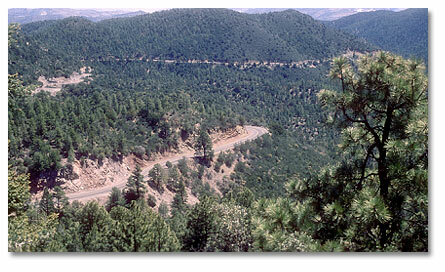 The sixth largest national forest in America, the Gila encompasses the first national wilderness area established in the United States. It is during your drive through the Mimbres Mountains that you will encounter the succession of S curves that give character to Highway 152. Within two miles of leaving Kingston, you will climb 1,000 feet. The state has posted signs advising you that the speed limit is 25 mph. In some places, it seems that the state has set the speed limits too high. It should be closer to 15 mph. As you reach increasing heights in elevation, you’ll also notice a corresponding drop in the temperature, with the thermometer falling at least 10 degrees. After negotiating numerous S curves, you will reach Emory Pass, named for Lieutenant W. H. Emory, who chronicled the U. S. Army of the West expedition through the pass in 1846. In those days, the land still belonged to Mexico. At 8,828 feet, you come to the crest of the pass and begin the descent out of the Mimbres Mountains and into New Mexico’s Grant County. You are now about 30 miles from Santa Clara, the gateway to the Silver City area. Descending, a mile west of Emory Pass, you will find Wright’s Cabin Picnic Ground, a day use area, where you can pause for a leisurely meal under the ponderosa pines. Another mile and a half, you come to Iron Creek Campground, where you can camp for the night if you wish. The site is level, and it offers picnic tables and toilets. Another two miles, and you come to the somewhat more primitive Upper Gallinas Campground. You may find water in the seasonal creek. Still descending, you will discover, over the next two miles, numerous wilderness vistas that are rich in photographic opportunities. When you reach Mile Marker 23, at 6,700 feet elevation, the ponderosa pines of the higher country have given way to the pinon and juniper trees of the mountain flanks. You will leave this part of the Gila. The road straightens somewhat, with a speed limit now set at a breathtaking 35 mph! Four more miles, and you can zip right along at 55 mph. You’ll begin to see ranches scattered along the route. Inside the 16-mile marker, you’ll reach the village of San Lorenzo. Here, Highway 152 crosses the Mimbres River and State Highway 35. At this river crossing and highway intersection, you have choices to make. You can continue west, on Highway 152, and you’ll pass the Santa Rita open pit copper mine, owned by the Phelps Dodge Company. There, you’ll find a large parking area that gives you access to an unparalleled view of this awesome hole in the earthone of the largest open pit mines in the world. To the east, you can see the Kneeling Nun, a rock formation that has given rise to many folk stories and legends in the area. A few miles farther west, you come to Santa Clara, the end of Highway 152, at the intersection with federal Highway 180, which will take you into Silver City. Alternatively, at the Mimbres River crossing and highway intersection, you can turn north and travel roadways 35 and 15 for about an hour up through the Gila Wilderness past Lake Roberts to the ruins of the Gila Cliff dwellings, a prehistoric village of the Mogollon Puebloan people. It is now a National Monument. Or, you can turn south, following State Highway 61 down through the Mimbres River valley for half an hour to the City of Rocks State Park, where you will find massive pinnacles sculpted by nature from 35 million-year-old volcanic stone. Whatever your choice, you will discover, at the western end of Highway 152, a panoply of attractions that will make the S curves seem like just a warm up for your photographic eye. It is a picturesque drive with a rewarding conclusion. 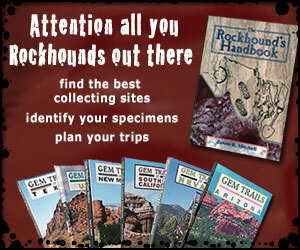 Thirty campgrounds, picnic sites and rest areas are scattered throughout the Gila National Forest. Fees are charged for overnight camping at Juniper, Pinon, Dipping Vat, Mesa and Upper End Campgrounds. There is also admission for use of the Little Walnut Group Area, which is used for picnicking. For more information contact any of the Gila National Forest Ranger District Offices, which are located in Silver City, Glenwood, Mimbres, Reserve, Truth or Consequences and Quemado.